The controversy surrounding female ordination is not a problem restricted only to Christianity. Even though ordination of women in Buddhism occurred during the life of the Buddha, his initial reluctance to ordain women seems to have been misinterpreted by many people. This misinterpretation has left a legacy of doubt and indecision among the orthodox Buddhist leaders. Some Buddhist countries did not even introduce the Bhikhuni ordination while others who did could not sustain the lineage for long. 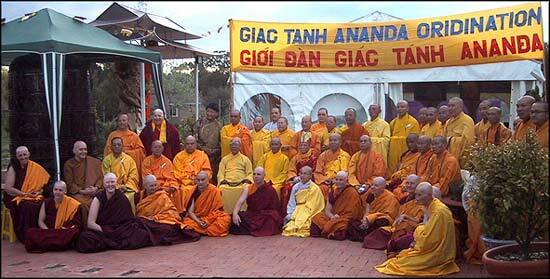 The Bhikhuni ordination was never introduced to Tibet even though there are hundreds of nunneries there. Theravadin tradition lost the lineage that they once had and initiatives to revive the tradition in Thailand have faced stiff opposition from the mainstream Buddhist leadership. Tibetan Buddhists proudly claim that theirs is the complete form of Buddhism, but it would be hard to maintain this if Bhikhuni ordination is not established. It is said that in order to say that there is Dharma in a land there should be Sangha consisting of four members, including fully ordained Bhikhunis. Whatever are the reasons, there are miserably few female teachers in Tibetan Buddhism and a few seem to be in that position because of the merit of there being sisters or daughters of well known male teachers. Nunneries do not have qualified female teachers and even countries, which have a Bhikhuni ordination system, are reluctant to have female Buddhist teachers. One can only hope this is all in the past. Over the last four decades of the spread of Buddhism in the west, there has been strong enthusiasm to have the Gelong-ma ordination introduced into the Tibetan Buddhist tradition. Many female practitioners, after expressing their wish to take on Gelong-ma ordination to their Tibetan teachers, have had to travel to Taiwan or Hong Kong to get ordained in the Chinese tradition. Some orthodox Tibetan abbots have even questioned whether the Chinese Bhikhuni lineage is pure. This is largely to do with Tibetan prejudice against the Chinese and their lack of knowledge of the international Buddhist scene. The issue of Gelong-ma ordination has also been raised at a number of Buddhist conventions organized by the Council of Religious Affairs of Tibetan Administration but is yet to produce any tangible result. None of my Tibetan compatriots appeared willing to host such an event for fear of criticism from their seniors. Being a Tibetan Buddhist teacher living in the west for the last I8 years has taught me to be liberal and broad minded. Division between traditions is not in the spirit of Dharma teachings nor are there any grounds for it. Most people think I am a Sakya Tibetan teacher. Although it is true that I am trained in the Sakya tradition, I have found very little that is different from the other Buddhist schools, let alone between Tibetan Buddhist traditions. I have studied texts used by other schools and they are all basically the same, as they should be. Only the names of the teachers and authors and their style of presentation differ slightly. They may attribute the teachings and texts to being revealed from rocks or from the pen of a scholar, but essentially they have nothing new that Lord Buddha did not teach in the eighty four thousand articles of the Dharma. The doctrinal argument about emptiness etc is a problem of interpretation; even those within the same tradition may have different views. Dialectics can always find something to argue but when one practices the teachings there is no time for all that. It is the Dharma taught by the Buddha we have to honour. Vinaya comes as a gift of the Buddha to all who are fortunate to be born as human beings to practice. There is no separate Chinese or Tibetan vinaya tradition. To be ordained as a monk or nun has nothing to do with the lineages and sects that some have become preoccupied with. Non-compliance with the basic vinaya is more of a concern than the slight variation of interpretation about vinaya rules between traditions. In view of engendering the harmony and peace that religious tradition is expected to promote in this troubled world, it is high time that various Buddhist schools learned from each other. Tibetan Buddhism can go a long way if it has the humility to introduce the Bhikhuni ordination into their tradition with help from the Chinese or Vietnamese. After all Buddhism itself was introduced from India. The Chinese and Theravadin tradition could learn from the extensive study tradition of the great works of Indian masters preserved in the Tibetan tradition. The strictness of vinaya rules kept in the Theravadin tradition should be modelled by others, including the Tibetan tradition. The strict meditation and discipline model can be learnt from the Zen tradition. It is against this background that I found myself faced with the choice of sending my female students who wish to be fully ordained either to Taiwan or inviting preceptors to Australia and organising an ordination platform here. As cultural and linguistic barriers make it hard to travel overseas for such an ordination, I choose the latter. When I consulted His Eminence Chogye Trichen Rinpoche, from whom many of the nuns have already received their novice ordination, he supported my idea to organize a Gelong-ma ordination in Australia. Having received his blessing, I took the liberty to convene the Ananda Bhikhuni Ordination ceremony here. Historically, this is the first time a Tibetan teacher and organisation have convened such a platform. The platform was planned and organised over the last I8 months with the help of Venerable Thich Quang Ba, the abbot of Shakyamuni Buddhist Centre in Canberra. A number of the senior Tibetan Geshes and lamas were invited to be part of the preceptor council but most declined to participate for personal reasons. We also invited Ani Tenzin Palmo as she is a Gelong-ma who has been very vocal about this issue, but she could not attend due to a prior engagement. However, Ven. Dekhung Rinpoche agreed to sit on the platform together with many eminent Bhikhus and Bhikhunis from the Vietnamese tradition. In the end, we managed to invite 26 senior Bhikhus and Bhikhunis to form the Preceptor Council and hosted the event for the spread of Dharma, the source of happiness and lasting peace in the world. Many of the most Venerables from the Vietnamese tradition were more than pleased that they could offer their ordination lineage to the Tibetan Buddhists. The event itself included a three-day pre-ordination retreat held at Shakaymuni Buddhist centre followed by the Bhikhuni Ordination ceremony. Finally there was a thanks?giving breakfast held at Virupa retreat Centre in which more than I20 Buddhists participated. A press conference was held at the conclusion of the thanks-giving ceremony. I hope and pray that our Dharma sisters who follow Tibetan Buddhism do receive equal opportunity to practice, study and meditate by virtue of opening this new chapter in Tibetan Buddhism. I intend to organize similar Gelong-ma ordination platforms in India and Nepal and encourage Tibetan women to receive the same opportunity in the hope of promoting Dharma far and wide without obstacles caused by cultural conservatism. Anyone who is willing to assist me in any manner, or able to help finance such events in India, Nepal and Tibet should contact me. With many Dharma blessings.